Ginger grows in tropical soils, but its use expands to all corners of the globe. Few herbs are as widely used in cooking and medicine. Herbalists classify ginger as a “pungent bitter” that promotes appetite and treats nausea, indigestion, flatulence, and intestinal cramping. Although the rhizome (a type of root) contains essential oils, the likely have some benefit, the non-volatile phenolic compounds (gingerol & shogaol) are considered the main active ingredients. Gingerol binds to muscarinic and serotonin (5-HT3) receptors to reduce vomiting. 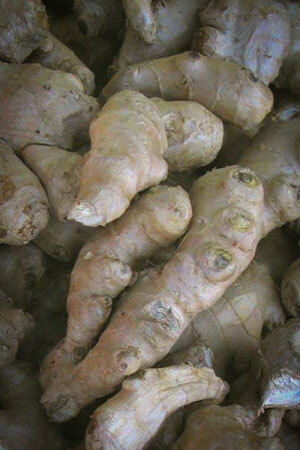 Clinical trials demonstrated ginger reduces nausea associated with morning sickness, travel sickness, and chemotherapy. By modulating serotonin receptors, ginger relieves anxiety. The benefits of ginger extend beyond the digestive symptoms. Herbalist use ginger to relieve pain and decrease inflammation. Research shows it down-regulates enzymes (iNOS and COX-2) gene expression and reduce inflammatory messengers (NO, PGE2, TNF-alpha, and IL-1beta). Clinical trials suggest ginger is effective and safe for treatment of osteoarthritis (OA). Furthermore, unlike many anti-inflammatory drugs (NSAIDs) that cause ulcers, ginger protects against ulcers caused by these drugs. Also, it works synergistically with acetaminophen (Tylenol) to reduce pain and protect against the hepatoxic effects of the drug. Ginger decreases the severity of migraines headaches with fewer side-effects compared to triptan (sumatriptan) drugs. Numerous clinical trials support ginger for menstrual cramps presumably because of its anti-inflammatory and antispasmodic actions. In Chinese medicine, this warming herb stimulates circulation to relieve cold extremities and a faint pulse. Research shows it relaxes arteries, lowers cholesterol, scavenges free radicals, decreases inflammation and helps thin the blood. Through these mechanism ginger likely reduces the risk of heart disease and further research is warranted. Furthermore, it shows promise in diabetes because it benefits glucose control and insulin sensitivity.